We hear a lot about quartal voicings these days but apart from the diatonic ones there's very little information about them out there, so here's a bit about how to pull these harmonies out of scales and some ideas about learning and applying the results. As you can see, the most common chord qualities -- major, minor, dominant, half-diminished and diminished -- tend to crop up when harmonising in thirds. That's not surprising: those chords are made by stacking up (major or minor) thirds! If you don't already know about this, go and learn it thoroughly first; the rest of this article is for those who are already very familiar with it and want some new sounds. Notice, too, that to build this chord-scale all I had to do was pick a starting chord (C Maj 7) and then move every note in it up one step in the scale to get the next chord. Repeating this gives us a total of seven chords; the next one would just repeat the starting chord up an octave. This is a useful general technique -- Kurt Rosenwinkel is quoted as crediting it with helping him expand his chord repertoire. Chords built from stacks of fourths instead of thirds crop up in classical music from around 1900 onwards. They find their way into jazz mostly in the modal style -- McCoy Tyner is a major figure in its development. In general it has an open, ambiguous sound with very little dissonance. Here are some voicings. I've included 4-note chords on the top and middle strings; theer are lots of other possibilities. To my ears placing these on the bottom four strings, or using more than 4 notes, produces a rather muddy sound but of course you should experiment. The 3-note versions are popular, too, but of course you can find those just by deleting the top of bottom note from a 4-note voicing so there's no need to learn those separately. It's not terribly productive to think of these as seven chords with different roots: instead think of them as seven ways to play CMaj7, some more radical than others. It's worth playing with a pedal C in the bass to help you hear them that way. When you see a tonic CMaj7 chord (or equivalent) in a tune, the idea is to play any of these voicings you like, just as if you were playing a C major scale, which in a way you are. If you want that pianistic sound, play several of them to create moving lines rather than just sitting on one static chord grip (see Bert Ligon's famous essay if you're not sure why you might want to do that). Remember, too, that the major scale has seven modes, so exactly the same voicings can be used to imply Dorian, Phrygian, Lydian, Mixolydian, Aeolian and Locrian sounds. That means they can work on Maj7, m7, Maj7#11, 7 and m7b5 chords, which is most of what we come across on the average lead sheet. All you have to do is find the right places to play them, and as long as you know your modes as scales you can pretty much build them on the fly. We can do exactly the same trick with the other two common heptatonic scales, giving us even more options. Because of their interval structures these scales don't produce "pure" stacks of fourths: we get some thirds creeping in here and there. But that's OK. These are less frequently heard but I think I hear them in many younger players -- in any case, I think they sound hip and they're very easy to apply. 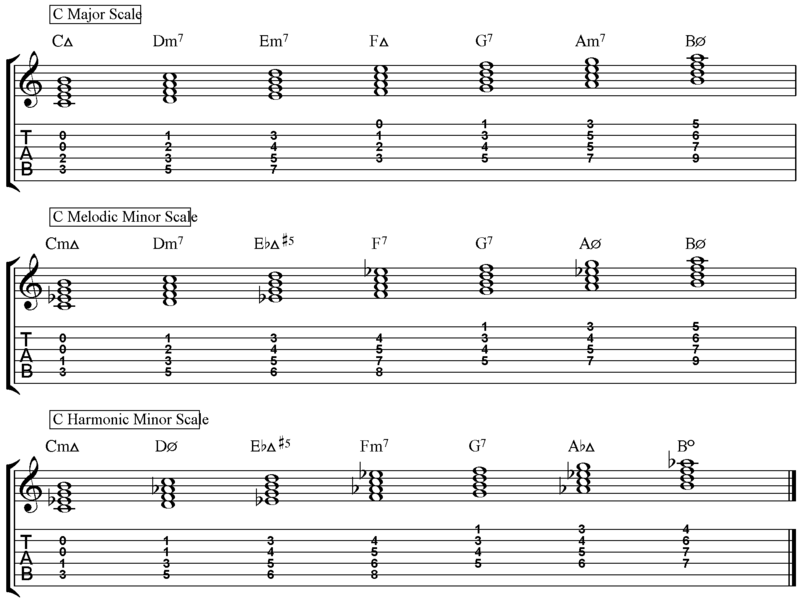 Just imagine you're taking a solo but instead of playing single notes from the scale, play it in stacks of fourths instead. OK, it takes a bit more practice than that, and of course it takes time to get these sounds into your ears so you can really hear (and hence really use) them, but that's not a bad place to start. To get used to these sounds, you have to be able to play them; but learning 42 new chord shapes (2 string groups x 3 scales x 7 chords) seems like a big task. Here's a quick-and-dirty way to start visualizing these in relation to the underlying chord. It's not sufficient on its own, but it will get you started playing these on Day One. In each case I'm only going to show you the basic one; you can work out the other six modes if you like this approach. So we'll see the major scale quartal harmony applied to a major triad and the melodic and harmonic minor applied to minor triads. We want to be as quick and simple as possible so rather than looking at five CAGED positions I'm going to look at just three -- E, C and A. With a bit of extension up and down these just about cover the whole fretboard. At this point the idea is to minimize the work up front and get us playing these chords as soon as we can, so there's no need to be thorough at this stage. I'm also only going to show you the top-four-strings voicings; you can work out the others easily enough. The idea is that when you hit a chord you'll naturally visualise the arpeggio in the position you want to play in (if you can't do that, you need to thoroughly master that first). Then learn to "see" the coloured notes sitting on top of it; playing all the notes of each colour gives you one quartal chord. As always, it's good to learn one thing at a time. Start with the major scale one and a single position, get somewhat fluent with that and then add the other two. Practice taking it through changes until it becomes fluent and you can find these voicings in any position, in any key, in real time. I can't stress enough the importance of learning the sounds of these chords as well as how they lay out on the fingerboard; that will come over time if you diligently use your ears as you experiment with them. Finally, you can use arpeggios of these chords in your single-note playing as well -- see this article by Jens Larsen for some ideas on that.